Discussion in 'Release Notes (Beta Versions)' started by avatar, Jul 9, 2014. 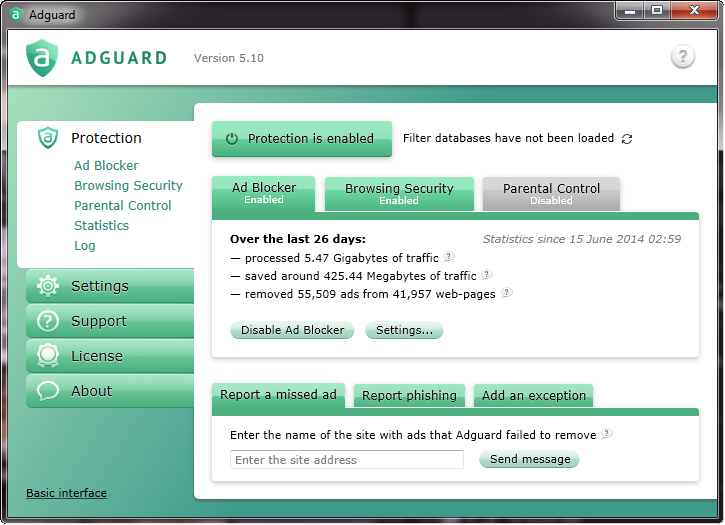 We are finally ready to release second beta version of Adguard 5.10. In addition to our own filters, you can now add known ABP subscriptions, such as EasyList and its supplementary subscription and others. Exceptions for HTTPS-filtering and Browsing Security can be configured there. + Ability to edit and export the userscripts. Version 5.10.1144.5852 is available now. It is almost release candidate. The single major bug is @Rian's issue with constant page loading. Second release candidate is ready. Version 5.10.1154.5920. If no important bugs are found, this will be the final 5.10 release. Next RC is ready (i hope it is the last RC). Version 5.10.1156.5925. A few more fixes brings version 5.10.1173.6059. Release candidate for second Adguard 5.10 patch is here, version 5.10.1185.6167. Noticed right off the bat, YouTube Center doesn't seem to work anymore - tested in all browsers including IE. I'll do clean profiles and re-test. Use previous developer build. They have broken something in the last build. In the meantime I'll use Tampermonkey/Greasemonkey for YTC. The widget.banner-square element on Neowin.net isn't being blocked anymore. Enabling EasyList might conflict with the Adguard filter lists if both enabled at the same time. @Petrovic I saw this and its not what I'm taking about. Yes, we can choose additional filters from the list, but we don't have ability to use other filter list (non shown there). Using Adblock Plus as web browser extension you can subscribe any URL filter list you want. also is it right to have it as "filters subscriptions" or can "filter subscriptions" also work ? -since the "Adblock Warning Removal List" is part of the Easylist group of filters, wouldn't it make sense to have it appear under EasyList ? - shouldn't the homepage link next to the "User filter" entry in the Ad Blocker section load the user filter section of Adguard rather than Adguard's homepage ? YouTube Center Developer Version is working again in Adguard (after I reported the issue) if you use 339 or above. I noticed that YouTube Center's settings (I assume local storage or something else) is being saved globally between all browsers, and not for each specific browser like it was doing not too long ago. This can be a problem as I prefer to force HTML5 in Chrome, while forcing Flash in Chromium (due to the lack of H.264 support in Chromium). Same with Firefox and Nightly, I prefer to force Flash for Firefox (until at least FF31) and HTML5 for Nightly. Is this as intended? Is it a bug or an oversight? Is it an issue with the script itself? They will all access https://raw.github.com/YePpHa/YouTubeCenter/master/devbuild.number. This could potentially be very insecure in that way that malicious website could steal information (through cookies). Also the Chrome x64 issue still exists with both dev and canary builds. Hopefully 37 x64 goes to beta soon! They should then return that object instead of the xmlhttp object. This will most likely also increase the compatibility with other userscripts too. A couple of ads are not collapsing as they did before. I put a red square around them in the screenshot. Note this happens on other pages at Neowin. Also, why would I choose to use for example the EasyList subscription over or with your English filter? Are using too many filters not a good thing to do? Also, can't check the box for 'Show useful ads". I'm also getting the "databases not loaded" bug. Thank you for all these bugs found! We'll release a new version today, fixing cosmetic issues. Cannot reproduce it, can you give me more details on this issue? UPD: ok, I've reproduced it now. Adguard's behavior is slightly different from ABP. So the subscriptions you see are served from our servers and transformed for better compatibility. It is intended. I think that YTC have been using local storage before and that's why you had different settings in different browsers. But now it sees GM_ functions implementations and uses them. Thank you for the bug reports! In my previous post I showed a screenshot of ads that were not collapsed at neowin.com. I since 'rediscovered' that this was always the case with AG. Manually blocking these gray boxes with AG does nothing to get rid of them. However, I also run AdBlock Edge along with Element Helper. Using Element Helper I am able to collapse these boxes. Shouldn't the boxes be automatically collapsed by AG in the first place and why does your block element function not collapse them as does Element Helper? As far as the problem I reported on the HowToGeek site, this was caused by some filter in Fanboy's Annoyance list. I'm now just using Fanboy's social list. But it ignores our "workaround" rules (#adg_start_style_inject) which we've used for neowin. I've updated English filter, now everything should be ok.
Not sure if this is a bug or not. I removed the Fanboy's Annoyance List using AG's main menu. However, it still showed up on the filters list using the AG tray icon. Closing AG and restarting it cleared it up. Adding a subscription doesn't make it appear using the AG tray icon. Confirmed, tray icon menu works really bad now.